There are a lot of great things about having an insulated garage door. The first and most obvious of which is that it keeps your garages temperature regulated- keeps it cool in the summer, and warm in the wintertime. But what if your garage its self isn’t insulated? Or if your garage isn’t even attached to your house? Does it still matter if your garage door is insulated? YES! Keeping your garage warm or cool is not the only function of an insulated garage door. Outlined below are five reasons that having an insulated garage door makes sense. 1. Insulated garage doors save you money. Many people complain about draftiness in their homes. When your house is cold and drafty, you turn up the heat. Likewise in the summer, if the hot temperatures are leaking through the garage, you might turn up the air conditioning. Having to constantly mess with your homes thermostat to keep your house a comfortable temperature means that your power bill keeps going up and up. Having your garage door being insulated means that it keeps the hot and cold air from circulating through your home so much. This reduces draftiness and keeps the hot/cold air in your house therefore stopping you from having to use so much energy. In the long run, this saves you money as well as helps you be just that much greener. 2. Your door is less noisy and keeps noise from outside, out! Non-insulated garage doors can be very noisy when they go up and down because they rattle and squeak. Insulated doors in comparison are more of a solid unit so they are much quieter in operation. This can be especially helpful if you have members of your household who leave early in the morning or who come home late at night. The reduction in noise is a lot less disruptive to the rest of the house. It also helps to keep your house and garage quieter as whole since sound doesn’t travel very well through insulated doors. Because of this, sound that comes from traffic or other neighbors outside stays mostly outside. 3. Insulated garage doors are sturdier. Clopay non-insulated doors are made out of one layer of 25 gauge steel. 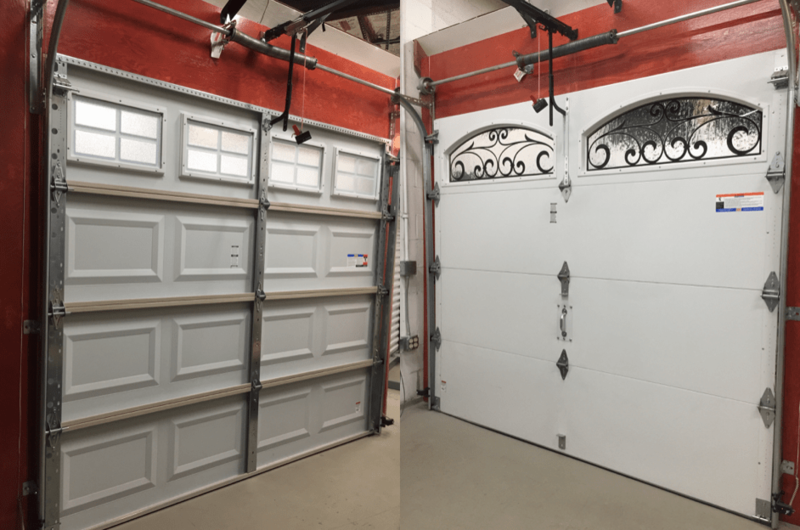 Clopay insulated garage doors are made of a front piece of 25-gauge steel, either polystyrene or polyurethane insulation, and one more piece of 25-gauge steel. This means it’s more than twice as sturdy as a non-insulated door! Because of the extra materials that insulated doors are made with, it’s way harder to dent or ruin an insulated garage door than it is to dent or damage a non-insulated door. People hit their doors with their cars ALL THE TIME. It’s a sad and sometimes embarrassing reality but it happens. And when it does, non-insulated doors are usually completely ruined. If the person has an insulated door, the door is often still operable. 4. Insulated garage doors last longer. Because insulated doors are sturdier, they generally last longer than non-insulated doors. Non-insulated have been known to buckle and bend with extended use. Because there is only one layer of steel to the door instead of two with insulation in the center, the door can’t stand up to the pull and pressure of using the door over and over again like an insulated door can. The more door you have, the more it will stand up to extended use. 5. Insulated doors increase the value of your home. In remodeling magazine’s cost vs. value report from 2016, replacing your garage door offers one of the highest cost recoup projects in home remodels the recoup percentage given was 108%). Because insulated doors help you to save money, reduce noise in your home, and last longer, they increase the value of your home. Even if you aren’t wanting to sell your house in the near future, it’s never a bad idea to do things that will help to make your home more valuable. There are lots of things that make an insulated garage door worth the purchase. Energy conservation to longevity of your investment, an insulated garage door is a wonderful choice for your home.